Baidu Japan faces a stiff challenge if it is to succeed. Chances are you've never heard of it, but if Chinese firm Baidu gets its way it will soon be a household name in the ultra-competitive world of internet search engines after launching a Japanese version of its site. Until now, Baidu.com has been far and away the most popular search engine in China with more than 60 per cent of search traffic there passing through its doors. Given the size of China it is, therefore, no surprise that Baidu has long been in the top ten most visited websites worldwide. The launch today of Baidu.jp is a bold move for the company as it faces an equally strong incumbent in the shape not of Google, but of Yahoo Japan , which is the de facto search choice for almost 90 per cent of internet users in Japan. 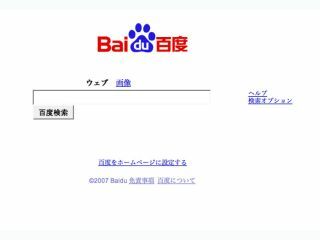 The initial Baidu Japan launch is a plain vanilla website, reminiscent of early Google, with just web and image searching offered. Other services, such as blogging tools and MP3 searches, used on the Chinese site will follow in time. If Baidu manages to crack the Japanese market it seems a question of when, rather than if, the Chinese gorilla will extend its reach to the English-speaking West.